Growing up in New York I literally saw the entire world when I rode the subway. Passengers sat reading newspapers in every language in existence. As a child I sometimes found it amusing trying to read the names of the various newspapers… but always got a chuckle when I saw someone reading the Yiddish language daily, The Forward…. it always amused me that The Forward was read backwards (Yiddish, like Hebrew and Arabic is read from right to left). Times have changed in New York, as in most other places. Most immigrants have been absorbed into the ‘melting pot’ and now read newspapers in English. 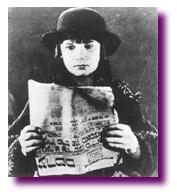 The Forward, due to the passing of most Yiddish speakers, is no longer a daily, and is no longer in Yiddish. Joining the 21st century, it even has it’s own Website and their articles can be read online. This is truly revolutionary, and would have been unheard of in years gone by. Internet technology was not known to most of the older immigrants, neither did it exist back then. Anyhow…. enough nostalgia for now…. the point of this post is that I found a very intersting article on the site of The Forward…. it might answer some questions as to how the Lobby and others are so quick to label anyone that dares criticise Israel as an anti-Semite…. it’s very cleverly called Not All Critics Are Our Enemies, and can be read HERE.